4.0 oz. SPF 30 Sunscreen Gator Gubba Sunscreen lotion with Parsol 1789 provide broad spectrum UVA/UVB protection. 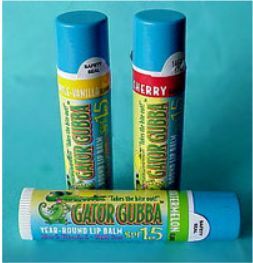 Gator Gubba Sunscreen has the smooth feel of a moisturizing lotion with the protection of a sunscreen. Gator Gubba’s fragrance free formula is non-greasy, non-oily and PABA free. Plus, natural skin conditioners and anti-oxidants Vitamin E, Aloe, Sea Kelp, Shea Butter, and Avocado Oil.